F This Movie! : Unsung! : Help! I have always considered Help! to be the red-haired stepchild of Beatles movies because A Hard Day’s Night, their first film, is so universally loved, so honored, so highly held in the hearts of hundreds—Help! cannot hope to hop the horrendously high hurdle that is A Hard Hay’s Height. Ha! The Plot in Brief: A cult of East Indians (Leo McKern, Eleanor Bron, and John Bluthal) cannot perform their daily human sacrifice because the chosen sacrificial virgin is not wearing the special sacrificial ring. The virgin in question is a Beatles fan and has sent the ring to Ringo Starr in a fan letter. The rest of the film details the cult’s (sometimes) comical attempts to retrieve the ring. Along the way, a mad scientist (Victor Spinetti) bent on (dare I say it?) ruling the world and his idiot assistant Algernon (Roy Kinnear) join the chase. Did I mention the Beatles perform seven songs too? The scenes featuring the songs—“Help!” “You’re Gonna Lose That Girl,” “You’ve Got To Hide Your Love Away,” “I Need You,” “The Night Before,” “Another Girl,” and especially “Ticket To Ride”—are like proto-MTV music videos and are clearly the main attraction here. Oddly enough, none of the songs has anything to do with the narrative of the film. I have always felt that Help! is a major hoot, and is sufficiently different from A Hard Day’s Night to stand on its own merits. You have to give the filmmakers credit for not simply recreating their previous mammoth hit. Help! has its own special flavor. Help! is also in color, and the eye-popping cinematography by David Watkins (this was his first color film!) is another highlight. Whenever I watch this film, I ask myself if it is racist. The sight of Brits playing comical East Indian characters with brown makeup and outrageous accents is surely no longer politically correct. Like The Party and Peter Sellers’ portrayal of Hrundi V. Bakshi, which I wrote about many months ago, I will leave it to better minds than mine to decide this matter. I do not consider it offensive; then again, I am not East Indian. It is interesting that this topic is never addressed on the making-of documentary included on the disc, even though Eleanor Bron, who plays Ahme in the film, is interviewed at some length. Another way of looking at Help! is through a soft haze of marijuana smoke. After all, the Beatles certainly did. In his famous “Lennon Remembers” interview for Rolling Stone magazine after the Beatles broke up, John admitted that A Hard Day’s Night was made while the Beatles were taking amphetamines (to keep pace with their impossible touring and recording schedules). This lends extra meaning and significance to the “We’re out!” scene where the four mop-tops gambol about in fast motion in a field. 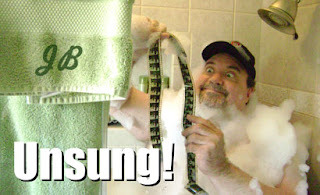 (Maybe that was not fast-motion photography after all!) In the same interview, Lennon admits that Help! was filmed while the four lads were nicely stoned on grass. In fact, in The Beatles Anthology documentary, Ringo tells a funny story about filming the scene with the explosive curling stone. “It’s a thingy! 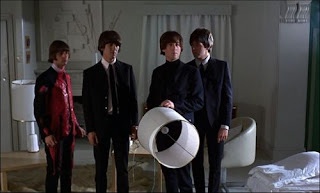 A fiendish thingy!” yells George, and that sets Ringo and Paul running away from it. Even after they were out of camera range, Ringo and Paul just kept running. Even after director Richard Lester yelled, “Cut!” Ringo and Paul just kept running. They wound up so far away from filming that they had time to light up some sploof on the walk back… which, of course, is why they ran away in the first place. The good news is that Help! is finally available on Blu-ray. The restoration of the film supervised in 2007 by Paul Rutan looks stunning in 1080p. Now here is the bad news: this is the same restoration and transfer performed six years ago for the film’s second DVD release. Why did it take Apple Corp. six years to do a simple port over to Blu-ray disc? Did Apple want to make sure that every single Beatles fan in the world had purchased the DVD before soaking them again for the Blu-ray? In the six years between the releases, couldn’t someone at Apple have come up with some new bonus features for the new Blu-ray? The mind boggles. I am the biggest Beatles fan I know, by weight if not by volume. 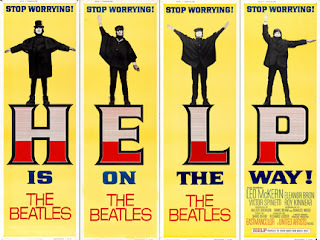 While I am thankful to have A Hard Day’s Night (from Canada, but still), Magical Mystery Tour, Yellow Submarine, and now Help! available on Blu-ray, I cannot understand why there is such a backlog of Beatles’ material still awaiting a release of any kind. It makes me think that Apple is one guy, one single solitary guy, manning the vault with no assistants, who can only concentrate on one project at a time. It also makes me wonder if Apple, for some reason known only to the two surviving Beatles, is waiting for every first generation fan to die before releasing Let It Be on DVD, The Beatles at the Hollywood Bowl on CD or iTunes, or The Beatles Saturday morning cartoons or The Beatles at Shea Stadium television special on any format. Step it up, Apple. I ain’t getting any younger. Help! is available on Blu-ray disc as of today. This is a cause for celebration, no? I consider myself a pretty big Beatles fan but (in your company especially) I'm embarrassed to admit I have never seen Help!. I'm going to partially blame that on it just not being that easy to find where I live, but I never really tried that hard, I guess because all I thought I cared about was their music. And having watched through the Anthology series a FEW times, it just seemed like their films were the worst of "their work" and I could safely ignore them. Now that I'm much more into movies in general AND am running out of "new-to-me" Beatles stuff, the time is ripe for me to add this to my Beatles/blu-ray collection. And your recommendation seals the deal - thanks JB - look forward to any other excuses you can find to write about the Beatles in this forum! I echo Sol's words here. I'm a HUGE music fan in general, and that especially includes the Beatles, and yet, I have never seen Help! (or, up until your recent podcast, A Hard Day's Night). Hopefully now with it being newly released on Blu-ray, I can correct that awful error stat! Like I said on Rock and Roll Day, I love this movie, while also acknowledging all of its short comings. Watching it last night it really stood out to me that during the "war" scene that it would have been better (maybe) if the cult had actually succeeded and captured Ringo, then have an act change where Ringo is trying to escape while the Beatles/Scotland Yard and the scientists try to rescue him. Just a slight change in the repetition that really sets in at that point. Oh well. Its strength though has to be its humour which remains fairly consistent though out the movie, not an easy task. Personal highlights are the 5 failed attempts, the look on the cultists face when he manages to get the tin of red paint onto Ringo...and Ringo's reaction, George in general, "we're not going there". and etc, etc, etc. I also particularly like that while the Help! soundtrack is performed during the movie that the movie's score are reworkings of other Beatles song. Its a nice touch. Great write up, mate. Probably the most "sung" of all the Unsung movies. Get it....zing....oh...? I am also baffled at the lack of progress when it comes to getting all these Beatles film projects out. There was a time when Anthology was released in 1995 where interest seemed to be at a peak and there was discussion of releasing everything, including the rooftop concert and Let It Be. But all we got after the third and last Anthology CD was Let It Be...Naked. I appreciate having that album without Phil Spector's embellishments, but I do prefer the classic, original album. That was pretty much the last new product that we got from Apple, wasn't it? We've gotten these movies re-released on blu-ray, but there's been no new material out of Apple Corps since then. As you point out, we've never had an official release of Let It Be, in spite of that being an official, Apple film. Like you, I don't understand it. It seems like it would be a license to print money. When the band's catalog went on iTunes, it sold extremely well. When they re-released the remixed CDs, they also sold well. Even the stereo vinyl reissues have sold well enough that they're going to do mono reissues. But for the last 20 years, we've gotten the same old stuff over and over in new packaging. I suspect that there have been conversations about preserving the image of The Beatles in the most positive light and not doing anything to tarnish their reputation, like the bickering seen in Let It Be. Is it possible that the cartoon series has not been released because Paul and Ringo are embarrassed by it? There's also never been an official release of all the promo videos that they shot for shows like Ed Sullivan, has there (Rain/Paperback Writer, etc)? Those videos are mostly shown in their entirety on the Anthology DVDs, but not always, and they're usually book-ended by conversation. I'd love to have those on a (legal) DVD or blu-ray, like a video companion to the red and blue albums. It really does seem quite foolish to sit on such a gold mine. Help! is a great movie just as a send-up of Bond films. Let It Be is probably waiting for Sir Paul to accept that he can't "remaster" the ugly parts of the film out. The Saturday morning cartoon show probably won't see the light of day (legally) because the guys HATED that show...and looking back on a few of the episodes you get their point.